The creative economy as an alternative pathway for industrial decline was first introduced into practice in metropolitan regions of the Global North. Since then, it has gradually spread out to other highly urbanized areas of the Global South and transitional areas such as post-socialist European countries. Numerous studies tried to explain structural conditions and suggested policies to attract, retain and release creative potentials. However, the focus on promotion of the creative economy is still on large cities and sectoral policies by emphasizing economic, social and legislative issues of the creative labour. There is little evidence about how territorial policies shape the development of the creative economy, especially in medium-sized and small towns outside the reach of the agglomeration areas. The aim of this paper is to study the impact of territorial policies on the distribution of the creative economy in Slovenia as an example of the post-socialist country. By analysing spatial-temporal trends of patents, we track patterns of innovation between 1975 and 2014 in the urban system. A central focus is given to examine changes in urban hierarchy, i.e. relationships between Ljubljana as the capital and the only large city in the country, regional centres and small towns. The spatial-temporal analysis of patents granted in Slovenia confirmed the linkages between territorial innovation systems and policies. The main findings show that innovation has become more evenly distributed across space, which can be attributed to long tradition of polycentric spatial development in times of Yugoslavia and more recent territorial policies favouring further dispersion of the local self-government system in Slovenia. Archibugi, D. 1992. Patenting as an indicator of technological innovation: a review. Science and Public Policy 19. (6): 357–368. Bell, W. 1973. The Coming of Post-Industrial Society. New York, Basic Books. Blahovec, R. and Hudec, O. 2012. Employment Analysis in the Creative Industries in Slovakia: Spatial and Temporal Evolution in the Years 2001–2010. Region Direct 2012. (2): 58–89. Bowen, H.P., Moesen, W. and Sleuwaegen, L. 2008. A Composite Index of the Creative Economy. Review of Business and Economic and Literature 0(4). 375–397. Cunningham, S.D. 2007. The Creative Economy: Patterning the Future. Dialogue: Academy of the Social Sciences in Australia 26. (1): 15–23. Egedy, T. and Kovács, Z. 2009. 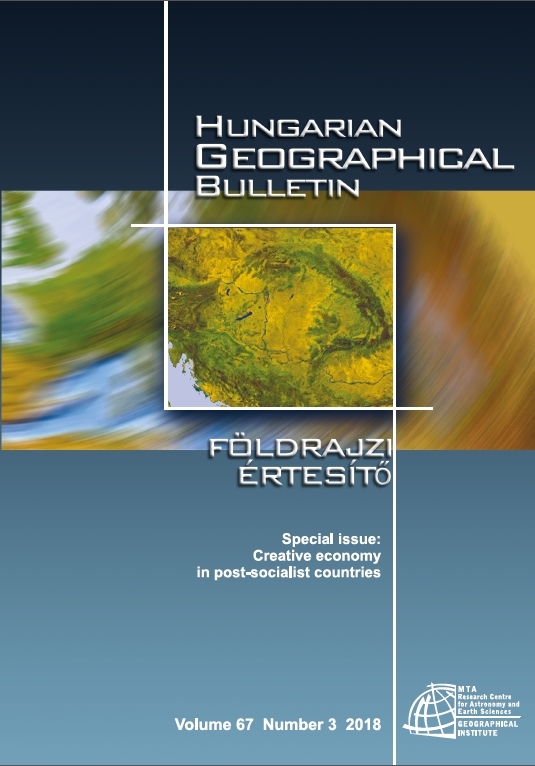 The capacity and potentials of Budapest to attract creative economy.Hungarian Geographical Bulletin 58. (4): 281–294. European Commission 2010. Green Paper – Unlocking the potential of cultural and creative industries. Accessed on 20.06.2018. Eurostat 2017. The new urban rural typology. Accessed on 12.07.2017. Forum D'Avignon 2014. The economic contribution of the creative industries to EU GDP and employment: Evolution 2008–2011.Accessed on 17.05.2018. Freeman, C. 1995. The 'National System of Innovation' in historical perspective. Cambridge Journal of Economics 19. (1): 5–24. Hägerstrand, T. 1952. The propagation of innovation waves. Lund, The Royal University of Lund. Hollanders, H. and Es-Sadki, N. 2017. Regional Innovation Scoreboard 2017. Accessed on 21.06.2018. Howkins, J. 2001. The Creative Economy: How People Make Money from Ideas. Harmondsworth, Penguin Books. Kern, P. (ed.) 2015. The Smart Guide to Creative Spillovers. Accessed on 20.06.2018. Kovács, Z., Egedy, T., Földi, Z., Keresztély, K. and Szabó, B. 2007. From State Socialism to Global Capitalism: Budapest on the Way to Creative and Knowledge-Based Cities. 2.4. ACRE Report. Amsterdam, AMIDSt, University of Amsterdam. Kozina, J. and Clifton, N. 2018. City-region or urban-rural framework: what matters more in understanding the residential location of the creative class? Acta Geographica Slovenica 59. (1): in press. Lhuillery, S., Raffo, J. and Hamdan-Livramento, I. 2016. Measuring Creativity: Learning from Innovation Measurement. Economic Research Working Paper 31. 1–24. Ministry of the Environment, Spatial Planning and Energy (MOPE). 2004. Spatial Development Strategy of Slovenia. Accessed on 29.08.2018. Musterd, S. and Murie, A. (ed.) 2010. Making competitive cities. Oxford, Wiley-Blackwell. Namyślak, B. 2013. Creative Clusters in Poland. Barometr Regionalny 11. (2): 25–31. Nathan, M., Vandore, E. and Whitehead, R. 2012. A Tale of Tech City: The Future of Inner East London's Digital Economy. London, Centre for London. Newbigin, J. 2010. The Creative Economy: An Introductory Guide. London, British Council. Pintilii, R.D., Peptenatu, D., Ciobotaru, A.M., Toma, S.G., Grigore, A.M., Drăghici, C.C., Dobrea, R.C., Simion, A.G., Andronache, I., Teodorescu, C. and Diaconu, C.D. 2017. Creative economies in Romania – spatial projections and trends. Bulletin of Geography. Socio-economic Series 37. (37): 95–108. Slach, O., Koutsky, J., Novotny, J. and Ženka, J. 2013. Creative industries in the Czech Republic: a spatial perspective. Ekonomie 16. (4): 14–29. UN 2015. Creative economy outlook and country profiles: trends in international trade in creative industries. Geneva, United Nations Conference on Trade and Development. Verbič, M., Srakar, A., Majcen, B. and Čok, M. 2016. Slovenian public finances through the financial crisis. Teorija in praksa 53. (1): 203–227. World Economic Forum 2018. Global competitiveness index 2017–2018 reports. Accessed on 17.05.2018.